Are you using an Owl Labs approved USB extension cable? Not all extension cables are equal! Some unpowered or poor quality USB extenders will not work with the Meeting Owl. We offer a tested and approved USB extension cable on our shop. Test with the 6ft cable that came with the Owl, and if the problem is resolved, replace the extension cable. Are you using a USB-C port? Some USB-C adapters and cables are not compatible with the Meeting Owl. We suggest using an approved USB-IF compliant cable like this one (UK). If using an adapter, try an approved USB 2.0 to USB-C adapter. Apple brand adapters, and Nonda brand adapters are tested to work with the Owl as well. We don’t suggest other USB 2.0 to USB-C adapters because they have not been tested. Unplug the Meeting Owl’s USB cable and plug it back into your computer. If your Owl's eyes do not pulse, turn the Meeting Owl over and check for a green LED between the power and USB cable. If there is no light, contact Owl Labs support. 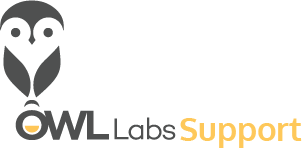 Try a different computer, and contact Owl Labs support if problem persists.